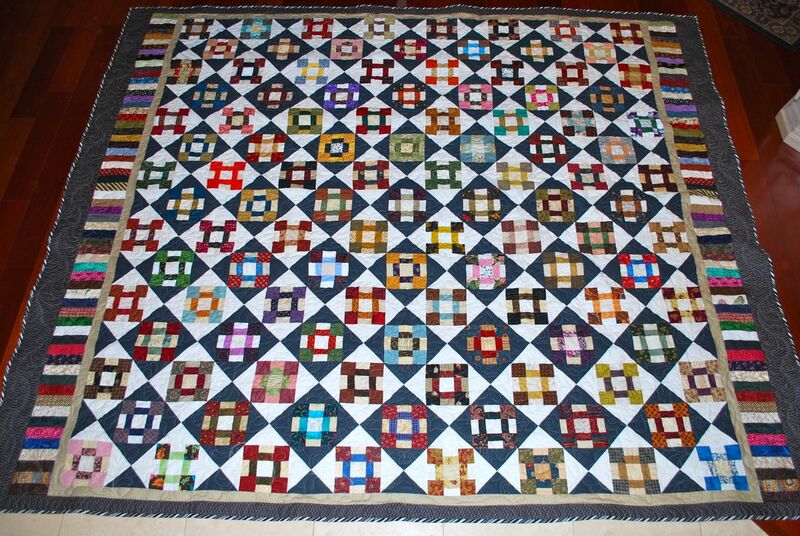 To me a scrappy quilt isn't a truly a scrappy unless it has many, many fabrics....whether in one color family or several. A blue quilt with, say, 8, or, 9, or 10 fabrics is ....a pretty blue quilt, not a scrappy, in my world. I'm talking 40/50/60+ fabrics = a scrappy for me! 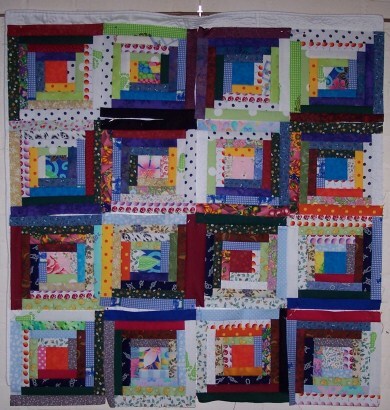 When I first started making scrappy quilts I used fewer colors but many different fabrics. Now I use many fabrics and many colors. Take a look at the free patterns and quilt examples on the website Quiltville.com. You'll see lots of examples of scrappy quilts. Once I was watching "Simply Quilts" and the woman was making a scrappy quilt, and she put her scraps in a paper bag, shook it up and used what came out. The only time she would put one back was if it was a piece of the same fabric. So when it comes to scrappy - anything goes. Controlled scrappy I understand. Scrappy formula for fabric placement is an oxymoron to me, at least past the placement of light next to dark. The more different fabrics, the better. I like scrappy quilts. the more fabrics and color the better. I use lots and lots. Like Aneal, what I control is value and color families. I never use the paper bag method. I want to control what goes where. My next scrappy on the plan is RWB, on a pattern of my own. 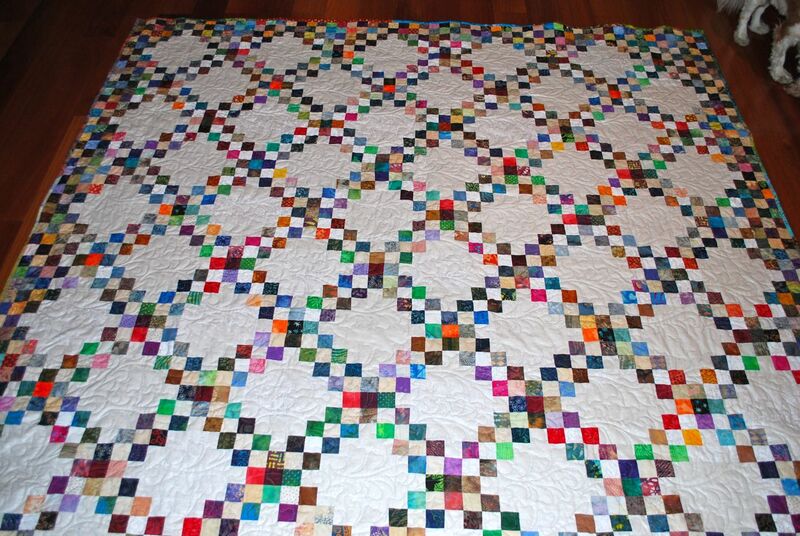 To me a scrappy quilt is every color of the rainbow. I don't think of a quilt as 'scrappy' if it looks like I bought the fabric especially for that quilt. I'm working on a quilt for my daughter that has 10 purples in it. It is not a scrappy because it is too planned. The last scrappy quilt I did was for a mystery class. I used 2 Tonga Treats packs of 2-1/2" strips. One had 2 strips each of 23 different colors called Bubble Gum and the other was 2 strips of 23 different beiges for the background. That is the most different fabrics I have ever used in a quilt. The pieced border was made from a layer cake of the same fabrics. Oh yeah, that's the description of my scrappy quilts too! Jan is right MORE the better otherwise I normally go NUTS when the same fabric is too close to itself. I made a "Tonga Coastal" this spring that had 96 different fabrics. And yet it doesn't really look scrappy because each box has only three fabrics to make the rounds. 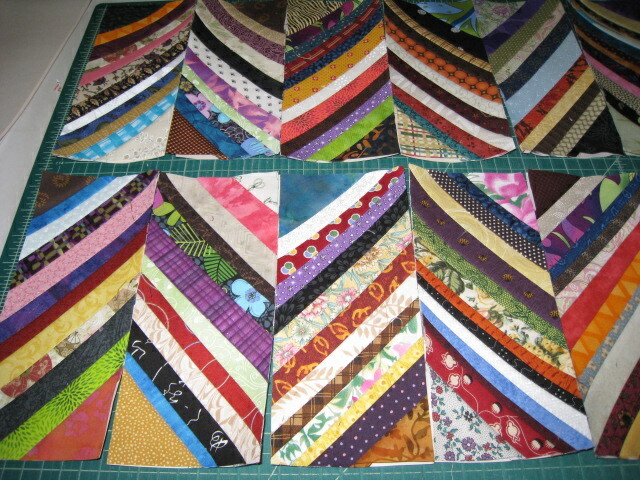 My scrappy quilts are crumbs or confetti, maybe sewn into blocks with neutral sashing or just all sewn together. Could be 100's of different fabrics. I'm with you, Jan! The only time I "control" the fabrics is when I decide to make one block all blue, or purple, or black and white. Even that isn't very often. Back to YOUR question...I agree with Anael and Woody, if you want to do a controlled scrappy, just keep the values together but use different prints within it. I DO like a lot of the controlled scrappys, too. Everyone has their preferences! I am a true scrappy girl. Like Jan said first, the more different fabrics the better. Quiltville changed my world. I've made 14 of her quilts and only one was made with 7 fabrics. That one was a scrappy Trips Around the World. My friend from S. Africa does travel around the world and she saw this fabric when I bought it. So that was her wedding gift. Bonnie does lots of controlled scrappy and I do love them. Here are a few. The one on the end is string blocks which are a blast to make. 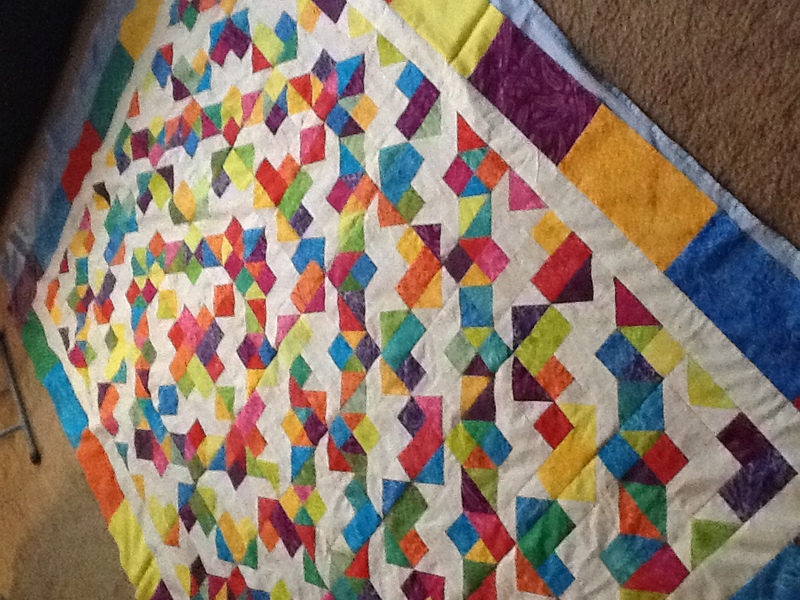 Judi in Ohio, what's the name of your second quilt? I love that! Can I find a free pattern do you think? I love scrappy quilts. I'm such a control freak I think I'll do the bag trick so I don't agonize over what goes where. Thanks! I love these quilts. I have yet to do a scrappy,. This is me too. The more fabrics the merrier but I do keep my eye on value and in some projects limited color families. I probably obsess more over block layout than over block making! "Try it - You'll like it!" I Love scrappy quilts and have made 6 plus table covers x4. The more color the better. Quiltville is and was my inspiration . That's a triple Irish Chain. Really easy pattern. I love the look of the triple Irish Chain - definitely going on my to-do list.